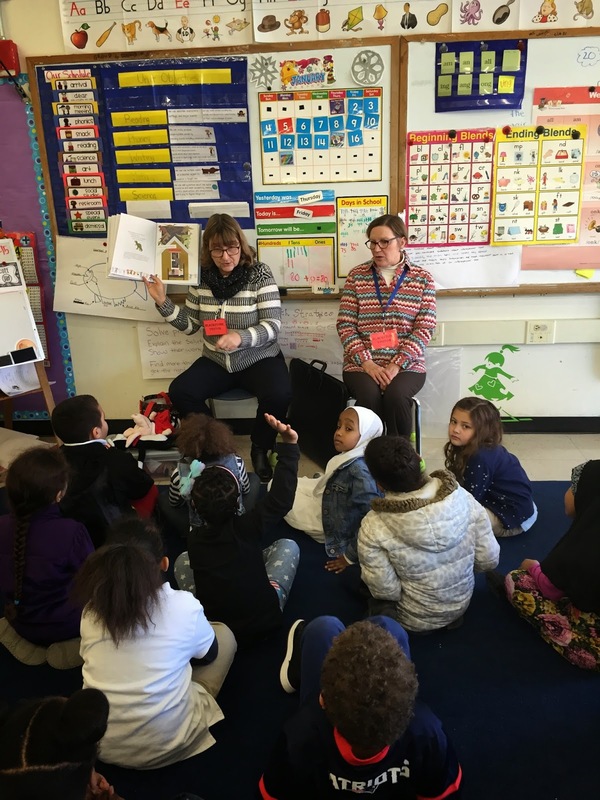 On Friday, January 16, the author and illustrator of Pajamas of my Dreams paid a visit to the Blackstone School's first-grade classrooms to share their book and help students with a collage project. Laurie Collins, the author, led the students through a fun and engaging meeting with a singalong, a rap, and a read-aloud of her book. Margie Florini, the illustrator, showed her original collages and talked to the kids about how she made them. All of our students were deeply engaged throughout their presentation, singing and laughing along, calling out their observations from the book, and sharing their own dreams. After the presentation, students continued to work on their own collages, which they had made backgrounds for the week before. They decorated paper pajamas with pictures of their "dreams" - from basketballs and stethoscopes to superheroes and fairies. Our visitors and teachers walked among the busy students, sharing cut-out paper and other decorations and talking to the kids about their collages. At the end of each class, a few brave volunteers came to the front of the class to share their "Artist Statements" in front of an audience of their peers, teachers, and special guests.